The home of Somerset will stage three fixtures at this year's ICC Men's Cricket World Cup. Three ICC Cricket World Cup 2019 fixtures will be held at the County Ground Taunton, home of Somerset County Cricket Club. Overlooked by the towers of three churches, the County Ground Taunton is one renowned for its character and history. It has been in use since 1882, and staged one game in the 1983 World Cup and two in 1999, including India’s clash with Sri Lanka, where they racked up a huge 373/6. In 2017, the County Ground Taunton was host to the ICC Women’s World Cup, with seven fixtures taking place at the ground. To find out more about the accessible facilities and services at the County Ground Taunton, check out the CWC19 Access Guide here. 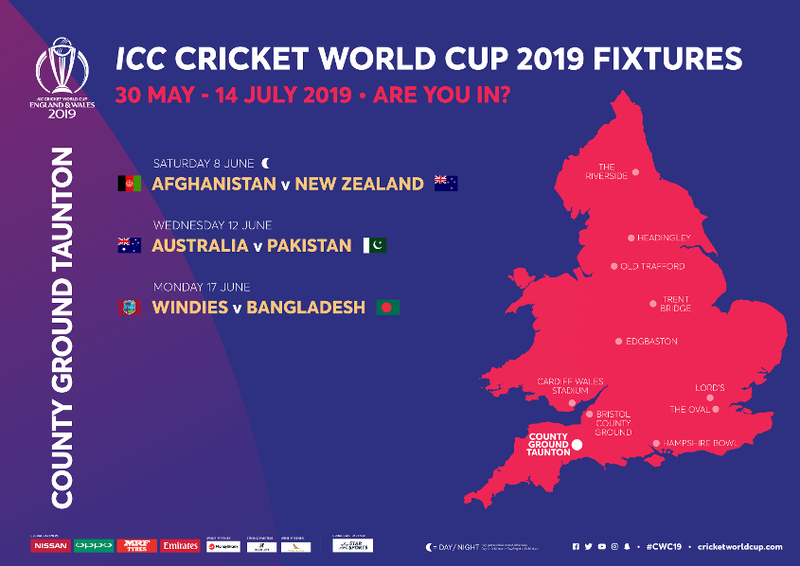 Plan ahead so you can make the most out of your day at the County Ground Taunton during the ICC Men’s Cricket World Cup 2019. County Ground Taunton is in the South West of England in County Somerset. Taunton is approximately 48 miles from Bristol and 34 miles from Exeter. The ground is only 0.4 miles from Taunton Station which has regular connections to Bristol, Exeter, Cardiff and London, making Taunton easily accessible by train. If you want to leave the car at home rail is a great travel option. There are two purpose-built park and ride sites in Taunton which are located just a short distance from Taunton town centre. The buses which service these Park and Ride sites will terminate at Taunton Bus Station which is 0.4 miles from the County Ground Taunton. Located directly off the M5 and operates a Monday-Friday service. For the Cricket World Cup this will also be opened on Saturday 8th June to support the day/night match. Located off the A358 and operates a Monday-Friday service. For the Cricket World Cup this will also be opened on Saturday 8th June to support the day/night match. There is no official on venue parking available for the Cricket World Cup. There is no blue badge parking directly on venue however there are some blue badge spaces located in Cannon Street car park which are available on a first come, first serve basis. Taunton Station is operated by Great Western Railway (GWR) who provide links to Bristol, London, Cardiff, Exeter, Plymouth and many other destinations. CrossCountry Trains provide services to Birmingham, Newcastle, Penzance and many other destinations. The station is expected to be under some construction during the event and we recommended that you check www.nationalrail.co.uk or https://www.gwr.com for the latest information on schedules and planned disruption. If you have accessible requirements and require assistance, please make this known with your rail operator so they can ensure that you have a safe and comfortable journey. Taxis can be found either at Taunton Train Station or along Corporation Street (50m from the Burma Memorial). At present Uber does not operate in Taunton. The official ICC Men’s Cricket World Cup walking routes are from Taunton Bus Station and Taunton Train Station, both routes will be supported with signage and World Cup Cricketeers will help to guide you to the ground. For those local ticket holders who wish to walk to the ground there are several walking routes which follow the route of the River Tone and will lead you directly to the venue. Dedicated cycle racks are available free of charge at the ground. Stewards at the gate will direct any cyclists wishing to use these on the day to the St James Street entrance. There’s more to life than work, and Taunton Deane is not only one of the most attractive places to locate to, it offers a unique environment and great quality of life too. With a population of under 60,000 and located between two areas of outstanding natural beauty, The Blackdown and The Quantock Hills, Taunton is genuinely the best of all worlds, you can choose from rural, suburban or urban environments, and benefit from short, easy commutes. Taunton offers a thriving dynamic cultural life and is home to our amazing County Ground. The area is well supplied with golf courses and tennis clubs, indoor swimming pools and leisure centres. There is a comprehensive, high-achieving rugby, football, hockey and cycling clubs, if horse racing is more your thing, Taunton Racecourse can provide a thrilling afternoon out. The Tacchi-Morris Arts Centre and The Brewhouse Theatre offer wonderful performance venues with outstanding facilities. Both provide the community with a busy year long programme of performances and classes open to all the family. 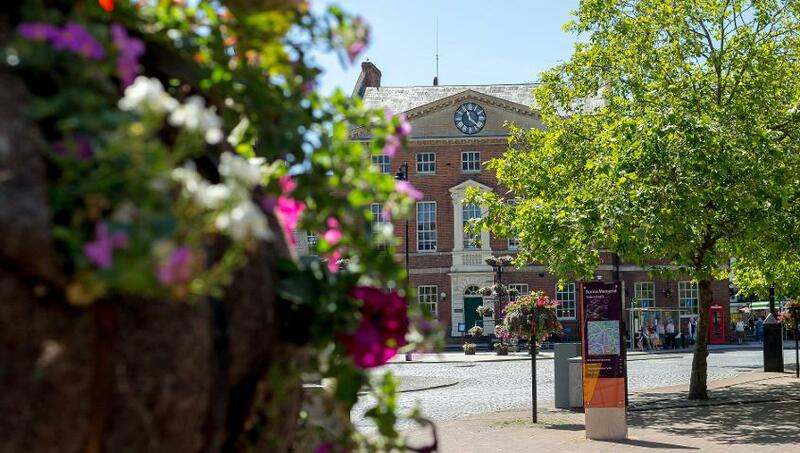 Taunton town centre boasts award-winning public open spaces, these come alive with festivals, street theatre and the hugely popular Taunton Flower Show. Markets and family events regularly occupy the spaces, making the most of the town centre. The Old Stone Cider Press was a gift to Taunton and its people in the Golden Jubilee year in 1971.